This week's focus on Toth features a story as far as I know has never seen print. Apparently done for the American Forces Press Service, as stated in the editor's note atop page one. I'm posting the entire eight-page story in sequence, which features a smokin' Jimi Hendrix-type character acting as troubadour narrator. I'll highlight and comment on favorite panels below following the story. Now, that's not a story that breaks new ground, or is a complete original, but it rings true, does the job for the intended audience, and within it, Toth displays typical moments of brilliance. It's drawn with bold line and spotted blacks, and thought it may seem too simple to some, the drawing is all there, and Toth conveys everything he needs to. For all his penchant to crop and focus on certain actions and items, he never forgets to establish the characters and place. In this shot, he brings a lot of humor and individuality to this character. With a few comics devices like the "Mail Call" box, sound effect, icons and thought balloon, he tells us a lot about this guy. Ah, remember the days when we used to look forward to and receive letters via "snail mail?" I'm all for new technology and modes of communication, nearly addicted to blogs, email and social sites, but gosh, I miss the days of sending and receiving an old-fashioned postcard or letter. In the panel below, I love the natural pose and body language of this superior. It tells us though he's taking care of his business, he's fairly casual about this situation, even as it may seem or be of dire consequence to the main character. And then in these two panels, once characters and conflicts are made evident, Toth pulls his neat trick of cropping out those very characters to focus instead, sometimes in extreme close-up the objects most at hand. Superlative storytelling. You can see what I mean here in the next four panel sequence, where he gives us two panels that are essentially "talking heads," but without them, in the next two following panels we'd be pretty lost. In those frames, he again crops in tight to give us great detail on the process of accessing the worth of the stones/diamonds. And in a near-final frame, Al salvages a little something for himself, while getting a little satisfaction in taking his crude chum, again Toth having no problem cropping both character to go close up on the ring. Nice stuff. The editor's note makes mention that this story was to appear in print sometime in a Toth collection, but I've never seen it anywhere but online. Fortunately, the scans are great. I'm not sure when this story was drawn, but I'd guess the late '70s-early '80s, given the style and content. The Crushed Gardenia is one of Alex Toth's most famous and lauded comics stories he drew. Published in 1953, it's a morality tale, a slice of stark crime fiction that appeared only about a year before Fredric Wertham had published his Seduction of the Innocent, claiming that comics led to juvenile delinquency. This short story puts the lie in part to Wertham's claim and remains largely a timeless piece, contemporary and modern in almost every sense even nearly sixty years later. For me, it is a prime template for how comics of certain genre should be drawn and told, an approach and style I seek to emulate. To read the story in its entirety, click the title above, if you'd like, before moving on to my highlights and analysis. I've cropped the opening splash panel which runs vertically along the entire height of the page. Toth's line is simple and flat, creating an angular and sharp look to the art, though there is a flow and sweep to some of the elements and composition. The victims lay foreshortened on the ground (not easy to draw, but Toth makes it look easy), surrounded by the petals of the title. This noir romance is peopled with all types of interesting characters, not least of which is the troubled and dangerous Johnny Faber. Every character in this story is distinct and unique, whether ruffian, psychiatrist, warden, policeman, shopkeeper, girlfriend, father or rival. Such care Toth takes in making sure each player is an individual, whether a main character or appearing in but a single panel, and all for an eight-page comic book story. I particularly love this following tier of panels, introducing his girlfriend, Ellie and her father. He establishes the garage in the simplest of terms, indicating the car with open hood, most of the rest of the panel in shadow, yet it's immediately clear where we are. Often throughout this story, Toth let's white areas run into each other, as well as black, creating interesting shapes and compositions, letting the eye of the viewer finish the picture and fill in the details. And yet, in the sequence above, with deft use of expression and body language he conveys a familiarity, tenderness and love between Ellie and her father, Sam. Of course, Johnny's jealous and brutal nature get the best of him, as we see in this panel, all sharp edges, swaths of black, twisted angles, lights askew and chaotic violence. Johnny can't control or outrun his bad behavior and attitude, let alone his lip, and it begins to catch up to him. He can't escape some payback and the consequences in another striking tier of panels. In frame one, Sam has had enough, but is still calm and collected, in charge of the situation, dominating Johnny who is relegated to the lower right of the frame, cropped. In frame two here, Johnny is still relatively small in the panel, enveloped in black, off balance. And in frame three, Toth chooses another unorthodox shot, showing just Johnny's legs and feet as he leaves the garage, humbled yet defiant. And yet more violence, as Johnny is confronted by Ellie's new beau. What a shot! We don't see the face of either fighter, as Toth instead uses the folds of clothing and a flopping tie to convey the movement and action. I couldn't pass up including these seemingly inconsequential panels (below), just because of Toth's brilliant use of point-of-view and sharp angles. He establishes the setting in a 3/4 overhead view on Sam's house as Ellie's date arrives, cutting back to inside where the background angles play off the previous panel and work within the composition of the whole page. All the info conveyed graphically by Toth here helps tell the story, but is subordinate to and in support of Ellie, the center of interest, as she places the Gardenia on her lapel. The story wraps shortly from there, things not ending well for Johnny, go figure. The Crushed Gardenia appeared re-colored in the early '80s in a reprint series called Seduction of the Innocent, playing off and tweaking Wertham on the title of his book. Those colored pages were annotated by Toth himself, a fascinating look at the thought process of the artist. He also goes into detail about his approach and use of drawing tools (he filed down a Speedball B-6 nib for lettering and drawing). He's a bit too kind about the recoloring, which I'm not particularly fond of, preferring there'd be a more flat color look over Toth's work here, rather than the hand-painted style and process that was the rage in the early '80s. The story has recently been reprinted with the original color as it first appeared in Who Is Next? (cover above) in 1953, in Setting the Standard, a comprehensive collection of Toth's work for that publisher in the early '50s. The colors are rudimentary, so I'm glad for the reproduction from the original art in the first big Toth volume, Genius, Isolated. 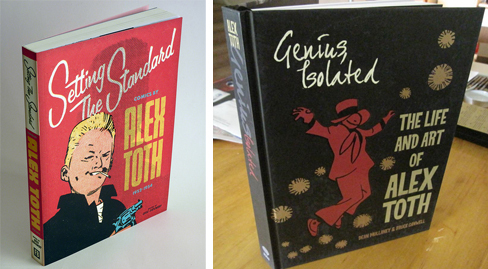 Do yourself a favor and pick up that book - great bio and lotsa superb Toth photos and art! Now, if I got this script, my first instinct would be to show the boy's face, his reaction, expression and emotion. But Toth instead focuses on the integral action of the panel and with a few simple lines makes the reader really feel the pain, the tug of those cruel fingers on the ear lobe. He zooms way in on the shot, cropping tightly, creating a very interesting composition. And somehow he finds the space to show the stepmother's other arm pointing through to the doorway and the boy's fingers on the lower left, indicating his pain and flinching reaction. And while Toth's line is simple, there's still subtle variation in line width and some different textures on the hat, hair, collar and shading on the woman hands and arms, all used deftly, just enough to break things up and convey surface qualities. The plain coloring (maybe five total - no modeling) actually help this panel, a far cry from the coloring we usually see in comics these days. In this story, Double Edge (written by Steve Skeates; DC's The Witching Hour #12, 1970), there are plenty of supernatural elements, themes of revenge, power and regret, which Toth handles superbly, Though appropriate and spot-on for the time, the dress and hairstyles in the modern-day scenes appear dated.The page below, however, is timeless and looks like Toth related to the material most in this story. In the first panel, you can feel the boy's weight on the bowed bed, surrounded by the things most dear to him. In panel 2, we see the threatening stepmother from below, the boy's point of view. In panel 4, we again don't see the boys' face as he leaves reluctantly, and see a glimpse of the stepmother in a interior shot through the doorway - he's forced out of his room, the stepmom invading his space. In frame 5 we see the boy's face, but small, in the background and cropped, as Toth focuses on a close up of the talisman, the most important object in the story. Then he pulls back for the final panel to establish place and context. In this sequence, each panel works well on its own, and the full page is complete and wholly integrated, setting up the rest of the narrative. Because he doesn't show the boy's face much, I wonder if he did this purposefully so readers could relate universally. But I also wonder if it creates a distance? He's pulling us in emotionally in one manner, but other artists' approaches could be completely different, but also emotionally powerful. These questions dog me, as I view the page as a masterpiece of comics storytelling, but though I'd seek to emulate it in my own work, I wonder for all its strengths if there would be advantages to handling the material another way? Update: A link to this story, Double Edge annotated by Toth himself, seems to be broken currently. Reading through Toth's comments on his own work, you'll find he's hard on himself. And on the particular page I focus on here, one that I love so much, he barely had a thing to say! Alex Toth is easily my favorite comic book artist. I've bumped into the occasional artist who just doesn't get all the hubbub about Toth's work, but most I've met admire and/or emulate his talent. He died in 2006, never having been firmly identified with one character, but rather left us a tremendous body of work that spanned from the earliest days of superhero comics 'til the '80s, through some of the best romance comics drawn, stacks of TV and adventure adaptations, years of character designs in the animation, the creation of Space Ghost, some top notch war and horror comics for DC and Warren in the '70s, tons of short stories and his superb mature work on Torpedo 1936 and his own Bravo for Adventure. His art is no nonsense, and "less is more," stripping out all but what is essential, his storytelling and composition clear yet daring, his draftsmanship rough but elegant. I've spent a lifetime pouring over his work, lucky if a bit sticks here and there. So, starting this week on my blog, I'll feature a Toth panel, page or illo with a few thoughts about what I think made him so great. This panel (above) is from one of my all-time favorite stories Toth drew, the first Torpedo 1936 story, a gangster series written by Sanchez Abuli, drawn in 1981. One can see at a glance, how he's cropped and framed to panel, spotted his blacks to lend weight and establish composition. A few strokes capture perfectly the character, mood and expression of the bald mob boss, as well as the black tie & buttons, flower, hanky and cigarette. Just a few well-placed marks add all the texture necessary and to keep the image from coming off too flat. Now, this is not my favorite panel from the story, but I've highlighted it here as others would give away too much of the story. It's brilliant. For context, the full page is below. Toth drew only one more Torpedo 1936 story, begging off as the scripts, he said were becoming too violent. It's apparent that with the second story, as good as it is, he was losing interest; it does not reach the level of this first story. Though he left, the series went on to retain the high standard Toth set with the art chores taken over by the astounding Jordi Bernet. These books have recently been repackaged in hardcover format, having been out of print for many years. For more by and about this amazing artist, you can't beat the first and Official Alex Toth Website, which features stories annotated by Toth himself, tons of art, a Toth "page of the day," fan art and forums, and the latest news. Whether a long-standing Toth aficionado or newbie, make sure to browse my other Tothpix posts, and the Resources links at the right sidebar.